The most amazing thing about handicraft tours in India is that you get the chance to be acquainted with the rich heritage and culture of the country. While it’s true that India is a spectacular paradise for shoppers, the best things to buy here are handicrafts. This is because you can always buy clothes, footwear, and handbags anywhere in the world. However, Indian handicrafts are bought best only in India. You can take handicraft tours in India to know in detail about these stunning handicrafts. Some handicraft tours in India can be done in a single say while certain others are spread over regions and may take days. 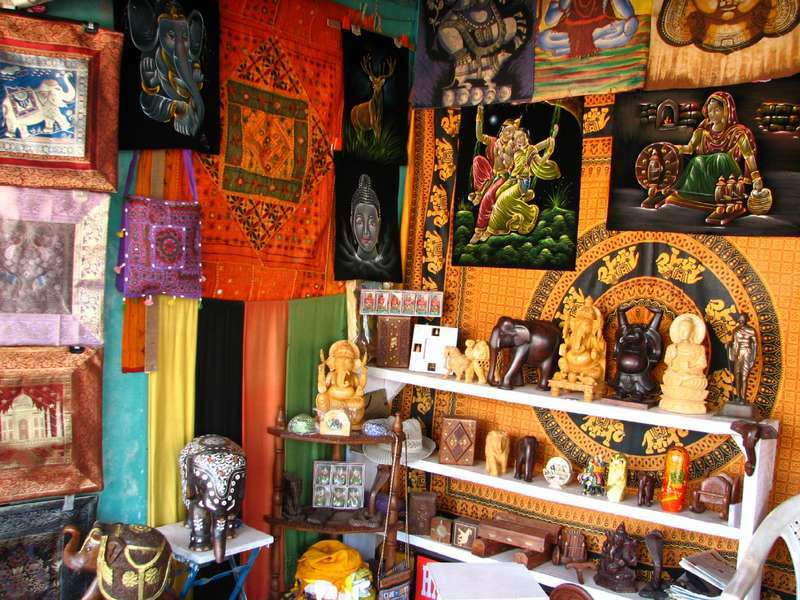 So pick a tour depending on what type of handicrafts you’d like to explore in India. Check our list of the best handicraft tours in India and decide which one you’d like to enjoy first. You can book cheap last minute flights for your trip in case you cannot make reservations in advance. Visit and enjoy the best ever handicraft tours in India! Being a cold region, Kashmir has excelled in the art of making woolen things. This is one of the most creative textile tours in India you can take. Expect to find carpets, shawls, and other woolen-made things as stunning as the landscape of Kashmir. While some items are made purely with wool, some have a blend of cotton in them. A must-buy item is the absolutely gorgeous and world-famous Pashmina shawl. Exceptionally soft, these shawls are made using the fur of the phantom-like Ibex that dwells over 14,000 feet above sea level. If you love wooden artifacts, one of the best handicraft tours in India you can take is to Saharanpur in Uttar Pradesh. Wood carving is not an ordinary craft in Saharanpur. Here, it is an art and craft that has been passed down from one generation of wood workers to the next. Dushi, Sheesham, and Sal tree wood are used to make all sorts of wood items. You can buy tables, wood-carved mirrors, large chests, vases, trays, key chains, religious idols, toys, cupboards, and other artifacts. For those who are unfamiliar with terracotta work, it is an art of making figurines using clay, mud, or earth. Visit Assam and enjoy craft tourism India has to offer on a whole different level! Assam’s Dhubri village is the best place to visit and enjoy one of the best handicraft tours in India. The skilled terracotta artisans make items such as religious idols, vases, dolls, and pots among other things. Buy anything from here and it will add to the charm of your living room. These artifacts are a symbolic representation of the cultural diversity of the region. This is simply the best fabric tour of India you can take when arriving on business class flights. Different from the other India quilting and textile tours, the handicrafts and textiles in Gujarat will simply leave you mesmerized. Think vibrant colors, excellent cloth, fancy mirror-work, and delicate designs. Also, there are fabrics which have gold-thread borders woven into them. The traditional tie-and-dye Bandhani work is another famous type of fabric work in Gujarat. If you love traditional clothes, then this is the best handicraft tours in India you should take. Also one of the best handicraft tours in India, Jaipur offers you the chance to explore the traditional handicrafts and textiles it produces. It’s one of the best textiles tour India has to offer. Exploit the opportunity to take handicraft tours in India and head straight toward Jaipur. You will be able to see (and study, if you wish to) block printing, miniature paintings, gorgeous blue pottery, hand printing, and enamel jewelry among other awesome things. Experience crafts tour in India like never before! You can explore more than just beautiful temples in South India. Tamil Nadu, for instance, has mastered the art of spinning stunning silk and cotton looms. Sarees are the best and most popular items made here. Kanchipuram sarees are the most famous ones in the entire region and you simply have to buy one! It’s one of the top handicraft tours in India to enjoy. You will also have the chance to check out handloom weaves and Kalamkari fabric. Gandhigram is where you will find a Khadi weaving and spinning center. There are plenty more handicraft tours in India you can take in addition to the ones mentioned above. So book cheap India flights from USA and come to enjoy as many of these fabulous handicraft tours in India as you can! You have the chance to not just look and study but to also buy some of the most amazing handicrafts in India.